This chapter describes how to view and search your membership records. To see a summary of the status of your memberships over recent months, as well as details about these memberships, you can use the membership dashboard or view the membership in an individual's contact record. To see a quick snapshot of your recent memberships, use the membership dashboard: Memberships > Dashboard. This screen contains two blocks of information that display a summary or your recent memberships, categorised by type and date range, and a list of recent member activity. All of the summary numbers are hot-linked. Simply click on a number to drill down and view a list of members who have joined or renewed over the last two months or the year-to-date, or who are considered current according to the membership status definitions. From this list of members, you can perform additional actions with the memberships, such as Delete, Edit, Export, Send Email to Contacts. 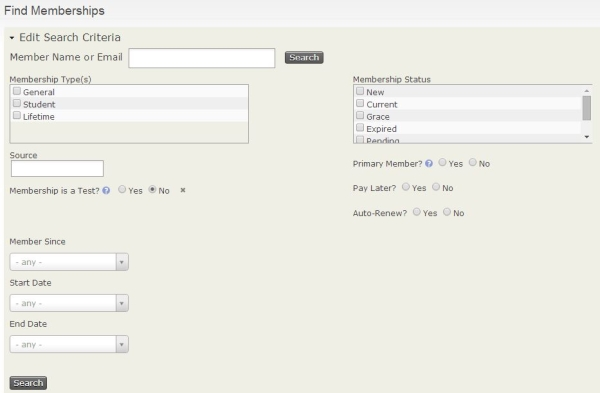 Another way to view membership records is by viewing a specific contact's record and looking at the Membership tab. If a contact's membership is "pending", the membership will show up when the tab is clicked but it will NOT be counted in the number on the tab. After finding the contact you wish to manage, click the "Membership" tab to view a summary of the contact's membership records. Membership records appear in a list with active memberships (those with a current status) first and followed by expired or canceled memberships. You can edit existing membership records, renew a membership, or create a new membership record. 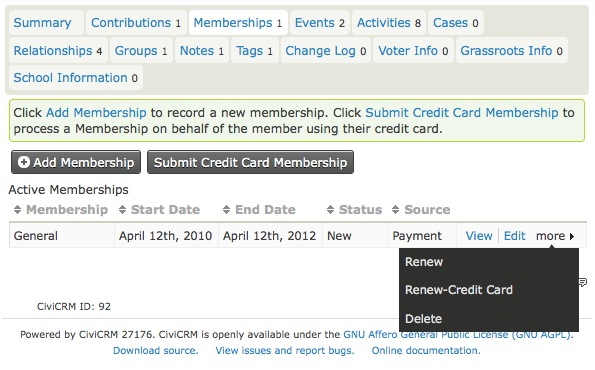 If you have configured an online credit card payment processor for use in CiviCRM, you will see two options for creating or renewing a membership: one for handling an offline record (no real-time transaction taking place), and one for handling an online record (using a real-time credit card transaction), which can also be used to set up auto-renew if the processor supports this. The interface for each process is very similar, except that the credit card option includes payment processing and recording options. If you are looking at the primary member contact record for a membership type that has inherited membership you will see a list of the contacta who have inherited the membership. In this case a maximum of two inherited memberships are allowed for people who are employees of the primary membership organisation. If one of the available inherited memberships is not assigned to the correct employee then you can click on Delete for that contact. This will free up an inherited membership for you to assign appropriately by selecting Create. After searching your records, you may want to send an email to selected contacts and include data field tokens to personalize the email message. then on the "Find Members" search results screen, select the records you want to import and in -actions- drop down, select Send Email to Contacts. CiviCRM makes an important distinction between contacts and memberships, which is blurred when we talking about 'members'. Consider the following question: 'How many members do we have?' This could be taken to mean 'how many contacts do we have that are members? ', or 'how many memberships have we granted to contacts?'. The answer to these questions is often the same but what happens if one of your contacts has more than one membership? The answer is that you'll have two memberships but only one contact. There's no right or wrong answer to the question should we look at contacts or memberships. It just depends on what you are interested in. It is important to take this into consideration when carrying out a search. 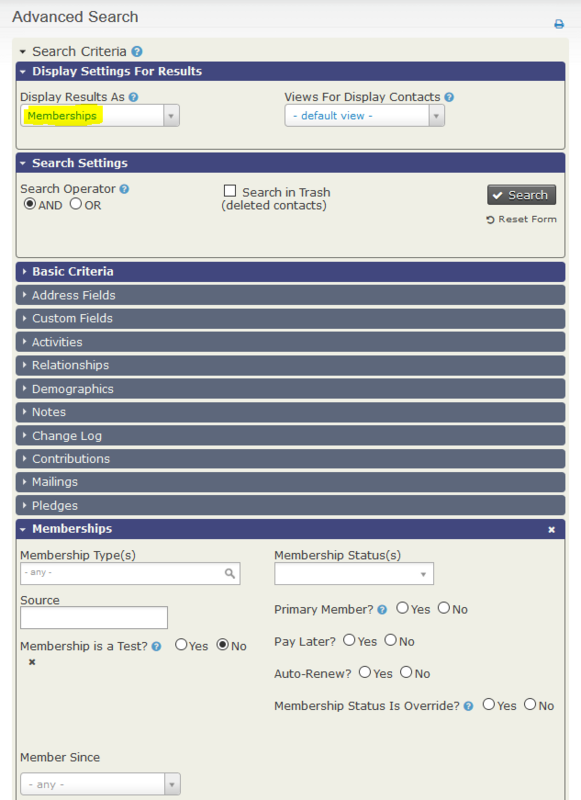 The Find members search allows you to search based on membership data and return membership data. Click on Memberships > Find Members, enter your criteria. Click the Search button. The Advanced search allows you to search based on some limited membership information (combined with other contact information) and return contacts. You can also choose membership from the Display Results As column to show members rather than contacts. To find out more about using Advanced Search, refer to the Searching chapter. Click on Search > Advanced Search and in the Display Settings For Results accordion set Display Results As to Memberships, enter your criteria. Click the Search button. Once you have found the membership information based on your criteria your search results will allow you to view some membership details. You then can perform further actions on your search results or a smaller subset of selected records, such as Email - send now or Export members by clicking on the Actions dropdown menu.